born on 22 July 2013 at 4:24 p.m. Happy Birthday, Prince George Alexander Louis of Cambridge! It was a dark and stormy night, in Olde Yorkshire, England. The date was approximately two weeks after we’d been married, in 1986. We were on our honeymoon, you see. We were traveling around the land of our dreams – England & Scotland. After about 2 weeks of driving from here to there, planning our itinerary as we went along with no firm plans made ahead of time, we had been up into Scotland, in Oban and then to Inverness and Nairn, down through Edinburgh and over to the east coast to visit Berwick-Upon-Tweed and Holy Island (see top of map below). 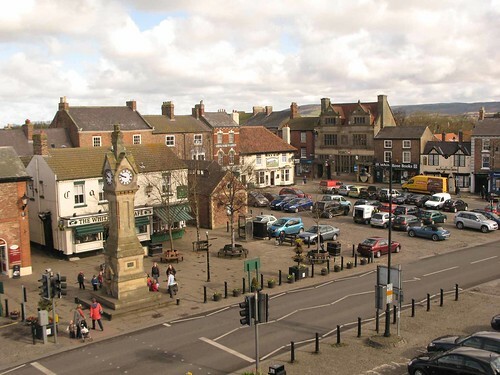 We crossed the border of Northumberland, driving along the east coastline, into Durham and back into Yorkshire and landed one late afternoon – one very dark and rainy late afternoon – in a town called Thirsk. 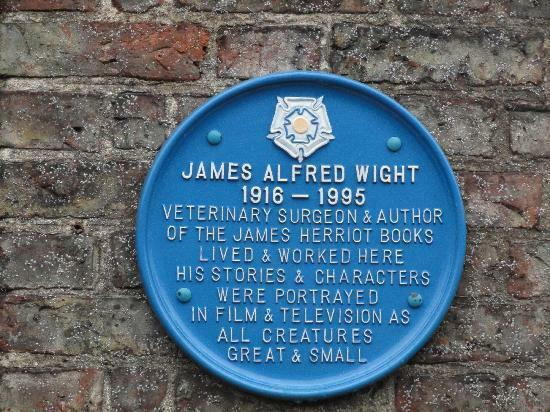 Our first visit to Thirsk – the same town where James Herriot practiced veterinary medicine all those years ago. It was quite off the beaten path and we almost never made it that night. We came very close to sleeping in our car! … with the plates on the front with the names of the doctors, etc., (Alf Wight, Brian Sinclair, etc. ), we set out for our B&B at Low Paradise. Here’s a little video showing the place we spent the next few nights of our honeymoon. If you look at the front of it, we were in the room way at the top on the left-hand side, with just the skylight for a window, under the roof eaves. So romantic it was. Especially when the fighter jets would come roaring through the valley right outside our window at all hours of the night – the noise was ear shattering! We thought we were in a war at first! You can have a look around by clicking on the smaller photos of the interior and exterior. I can remember having the most wonderful English breakfasts served up to us at that long dining table – it hasn’t changed much at all since we were there back in 1986. I’m sure it’s been sold at least once, though. I think the then-current owners told us, when we were there, that they were thinking of selling up but it was hard for them as the owner of the farm had been born and raised there, as had his father before him. It was their family home. So that’s all for now. Just a little glimpse into the past. It was during our initial trip to England and Scotland that we fell in love, for ever and ever, with that wonderful part of the world. 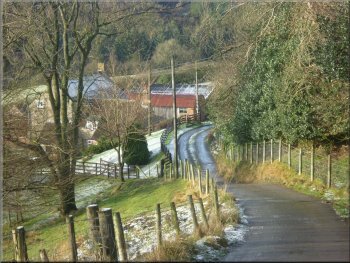 I told a friend of mine traveling to England to visit the Yorkshire area, based on your photos and writing. DH also let me know as soon as the birth was announced. Bex, that’s a lovely little house – but was the dining room really pink back then? That was rather startling. I loved the quaint character of all the nooks and crannies, though. I was excited by the birth too! Ed pretended to roll his eyes, but the fact is, he called my office as soon as he heard! I love this story of your trip! You could do that for us! Take us through that journey, day by day, so that we can see England through your eyes. Missed the royal birth, should of had the dentist office turn on the TV, but I was reading. Oh well our news will be full any way. From stem to stern I’m swooning. This is such a lovely story that pulled on the heartstrings in all good ways. Here’s to all things Herriot and British. A fellow Collie person and Anglophile. You have to be there to appreciate it, Eric. The owners were so nice to us.. we felt like royalty when there. We were the only guests at that time and had that whole table to ourselves, served by the Mr. and Mrs… with lots of stories about their lives etc. I would love to re-do that whole trip again.